Produktinformationen "Scythe - Blackfire Organizer"
This "Ready-To-Play" Organizer is designed for the successful strategy game "Scythe". It can carry all game components including the complete 6-7 player expansion. With this organizer all small compartments can be taken out at the table and the game will start immediately. No long setup phase, no sorting of money tokens and ressources. Just grab the small boxes, place them on the table and enjoy the game. 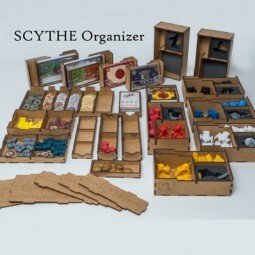 This organizer contains 6 card holders, 7 tokens & ressources boxes and 7 player boxes (including foam for miniatures). This can carry the Scythe core game and the 6 & 7th player expansion. Weiterführende Links zu "Scythe - Blackfire Organizer"
Verlags-Beschreibung "ADC Blackfire Entertainment GmbH"
Kundenbewertungen für "Scythe - Blackfire Organizer"